Why is the Emergent Church so caught up in environmentalism? Dr. Reagan: I become more and more convinced that the people involved in the Emergent Church Movement are moving in the direction of the old liberal mainstream Christianity in saying really what the Gospel's all about is environmentalism. To them it's the protection of nature and it's protection of Mother Earth. They're are also going to be bringing peace to the whole world. Caryl Matrisciana: It's the Social Gospel. Dr. Reagan: The leader of the Movement said in a statement, "The Church has been preoccupied with the question what happens to your soul after you die, as if the reason for Jesus coming can be summed up in Jesus is trying to help get more souls into Heaven as opposed to Hell after they die. I just think a fair reading of the Gospel blows that out of the water. I don't think the entire message and life of Jesus can be boiled down to that bottom line of saving souls." Caryl Matrisciana: How sad. How awful, because Jesus said that He comes so that none shall perish. He came to offer us eternal life so that none should perish if we accept His salvation. That was the whole purpose of Jesus Christ coming to this earth. Dr. Reagan: This same fellow held a conference in Seattle which our friend Eric Barger attended and he said, "We've interpreted John 3:16 incorrectly. It has nothing to do with salvation of souls. It has to do with the salvation of the world. Jesus came to die for the world." This false teacher invited people to come up afterwards and put their hands into dirt and commit themselves to saving the environment. Caryl Matrisciana: Within Eastern Mysticism the world is the Mother Goddess. She's the environment who should be worshiped. It is the matriarchal system, not the patriarchal. If we have to go even further back to Satan, Earth worship is demonic. It's satanic. We have to understand that just as there is a personal God, there is a personal enemy of God, and that is Satan. His attack has been on the Word of God and the authority of God and the purpose of Jesus coming to die for our sins. Satan said to Eve in the Garden, "Surely you won't die." Satan meant if she followed him she wouldn't die. If you follow me you'll get wisdom. If you follow me you can be like God. All of these are the fundamentals of the Emerging Church Movement. Nathan Jones: Would you say the movement then isn't from a particular denomination? Caryl Matrisciana: No, it penetrates into all the denominations. The people who are the leaders of the Emerging Movement claim that they came from evangelical backgrounds. Now, they may have come from evangelical church backgrounds, but they didn't understand the authority of the Word of God because they were raised in a Post-Modern generation. They've been taught the idea that truth is relative, truth is not knowable, and that with truth we need to debate it. We need to get into sort of a protagonist situation where we can debate and create our own truth. We get synthesis rather than thesis. Nathan Jones: Human wisdom then? 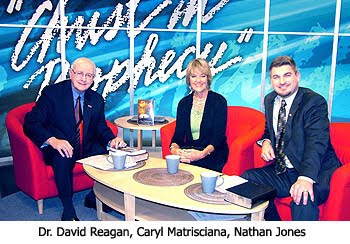 Caryl Matrisciana: It's all about human wisdom over God's wisdom. Dr. Reagan: That reminds me again of the leader of the Emergent Church Movement who was invited recently to come to Dallas to speak to one of the most outstanding evangelical seminaries in all the world right here in Dallas, Texas. The President of the Seminary was confronted by people who asked, "What are you doing? Why are you inviting this person in who is a wolf in sheep's clothing?" He answered that they were an educational institution and so had to be open to all ideas and allow all people to come in and speak. Those protesting suggested that if he was going to invite a person teaching a false Gospel, he should at least have a faculty member get up and be given equal time to confront him. His response was that, no, that wouldn't be polite. Caryl Matrisciana: How did I get involved in the New Age? It was because I was given a plethora of beliefs because this world is controlled by Satan. Satan is the god of this world, and I was under the seduction of seducing spirits and the doctrines of demons. If one doesn't understand the reality of Satan's warfare being in this, then we don't really understand the war that we are involved in. Recently we've had "America's Pastor" named by Time magazine. He invited three New Age completely Eastern indoctrinated, mystical doctors into his health plan to introduce his entire congregation of 22,000 people to a new health and wellness plan. These three doctors between themselves had an Eastern worldview even though one is a Muslim, one is a Jew, and one is a Christian mystic. They come from an Eastern worldview background which teaches that within ourselves is the potential to heal ourselves. Self healing is an idea that derives from Eastern Mysticism, that within us we can connect to divinity. We can heal ourselves. It's all mind over matter. It is self-hypnosis. This is what the Emerging Church is all about, bringing in "new" ideas from the East. They are not new ideas, though, they are old ideas. It is the old lie from the Garden of Eden. Dr. Reagan: To see how poorly these ideas work, just look at the society they've produce in the East. Caryl Matrisciana: It is not a nurturing society, and in fact it is a very cruel system. In the next part of this interview with Caryl Matrisciana on the Emergent Church, we'll ask her why they use so much mystical paraphernalia in their worship. The spiritual leader of the Emergent Harlot church has a busy day tomorrow! World faiths to attend Vatican ceremony. VATICAN CITY — Two hundred non-Christian religious leaders will join the pope for a ceremony on OCTOBER 27 that is being boycotted however by the influential Al-Azhar mosque in Cairo, the Vatican said. Pope Benedict XVI is hosting the event in favour of world peace, which was started by his predecessor John Paul II in Assisi, the birthplace of St Francis, and a variety of faiths will be represented including Islam. Among the spiritual leaders attending will be Baha'i, Buddhists, Confucianists, Hindus, Jains, Jews, Sikhs, Taoists and Zoroastrians, joining 100 Christian leaders, Vatican officials said at a news conference on Tuesday. A total of 69 Muslim leaders will also be present from 19 countries including Iran and Saudi Arabia, said Cardinal Peter Kodwo Appiah Turkson, head of the Vatican's Pontifical Council for Justice and Peace. But the Grand Imam of the Al-Azhar mosque has refused to attend as the Sunni Islamic centre froze relations with the Vatican after the pope expressed solidarity with Egyptian Copts following a New Year's bomb attack. Turkson said the meeting would call for "a common path" to peace but added that participants will all be asked to pray in silence during a short procession to the basilica of Assisi and in separate rooms after the ceremony. The cardinal said the changes had been introduced after complaints following the first such meeting in Assisi in 1986 from traditionalist Catholics, who said THE CEREMONY WAS PROMOTING SYNCRETISM -- the fusion of faiths.